Click on the links below to jump to a specific section of the page. Can I join if I am self-employed? Who actually owns the Package? What is the maximum certificate value employees can select through the scheme? Do you offer the Cycle to Work Scheme in the Republic of Ireland (ROI)? Do you have an Open Framework agreement? Can I join a Cyclescheme webinar? Cyclescheme is the UK’s leading provider of tax-free bikes for the Government’s Cycle to Work initiative. It’s a brilliant programme where everyone wins – employees make big savings on new bikes and/or accessories, whilst you get a healthier, more motivated workforce and enjoy significant National Insurance Contribution (NIC) savings. Cyclescheme works with specialist Retailers to provide an expert, convenient and user-friendly service to UK employers and employees (either in-store, online or click and collect). Services to employers are provided completely free-of-charge and include secure access to a scheme management website called, MySchemes. This online account gives you access to all your paperwork, a range of free marketing tools and also access to other benefits including Techscheme. Any size of scheme is catered for and we have a well-established reputation for fast and efficient service. What makes Cyclescheme the leading provider? Completely free of charge service to employers and their employees. With over 2,000 Retailers throughout the UK and our 'any bike guarantee', we have the largest supplier network on the market. The Retailers partnered with Cyclescheme are experts in their field and can provide advice to your employees when choosing a bike suitable for their commute. Our Retailers provide an unrivalled customer service experience and access to over 800 bicycle brands and the widest range of accessories. Automation of scheme processes that minimise administration, allowing employers more time to look after their business. Free of charge promotional material including posters, leaflets, our ‘Cycle Commuter’ magazine, and a host of electronic communications including our monthly newsletter. Knowledgeable and friendly Account Management team and Contact Centre dedicated to helping employers and employees through the entire lifecycle of the scheme. Peace of mind that our scheme adheres to HMRC, and Department for Transport (DfT) Cycle to Work guidelines. Ready to register? Sign up here. You (the employer) buys the bikes and/or accessories at full retail price. The balance is then recovered from a reduction in the employees’ gross wages (salary sacrifice). Through salary sacrifice, employees can expect to save a minimum of 25% whilst employers benefit from worthwhile National Insurance Contribution savings of up to 13.8% too. Typical savings for employees are a minimum of 25% for a standard rate taxpayer, assuming that Cycleschemes convenient end of hire process is applied, but the actual amount depends on the employee’s personal tax band and the way the employer runs their scheme. If the employer uses external finance (i.e. borrows the money to buy the bikes from an outside agent) then savings will be approximately 5% lower. Employers can typically save 13.8% of the total value of salary sacrifice, due to reductions in Employers’ National Insurance Contributions (NICs) due. 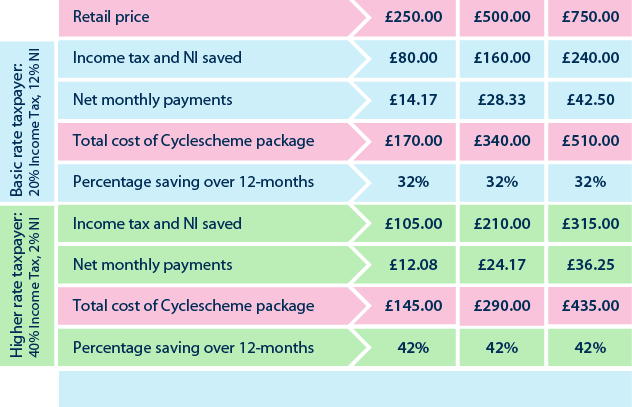 Below are examples of how savings are made during the Hire Period for basic and higher rate taxpayers on Cyclescheme packages over a 12-month period. This table illustrates the potential savings an employer can make by offering the scheme to its workforce. At the end of the hire period the employee must make another payment to take ownership of the Cyclescheme Package. Without this payment HMRC would class the agreement as hire purchase (rather than hire), and as such the tax exemption would not be available. Managing the End of Hire process can be the most time-consuming aspect of a Cycle to Work scheme. Cyclescheme can eliminate this - free of charge. Cyclescheme can handle all aspects of End of Hire administration and deals directly with employees to ensure they achieve the highest level of savings, whilst also ensuring the scheme is compliant with HMRC guidance. This service is provided completely free of charge to all employers. The Cyclescheme process offers three simple options - extend, pay or return. With 94% of Cyclescheme participants opting to ‘extend’, it’s clear that the high level of savings offered, coupled with the incredibly simple process - it takes just a minute to complete online - strikes the perfect balance between simplicity, ease and savings. Here’s how it all works. The employee make a one-off deposit (of either 3% or 7% of the packages’ original value) and continues to hire the bike (under an Extended Use Agreement with Cyclescheme), free of charge, for a further 36 months until its ‘market value’ is at it’s lowest (either 3% or 7%). 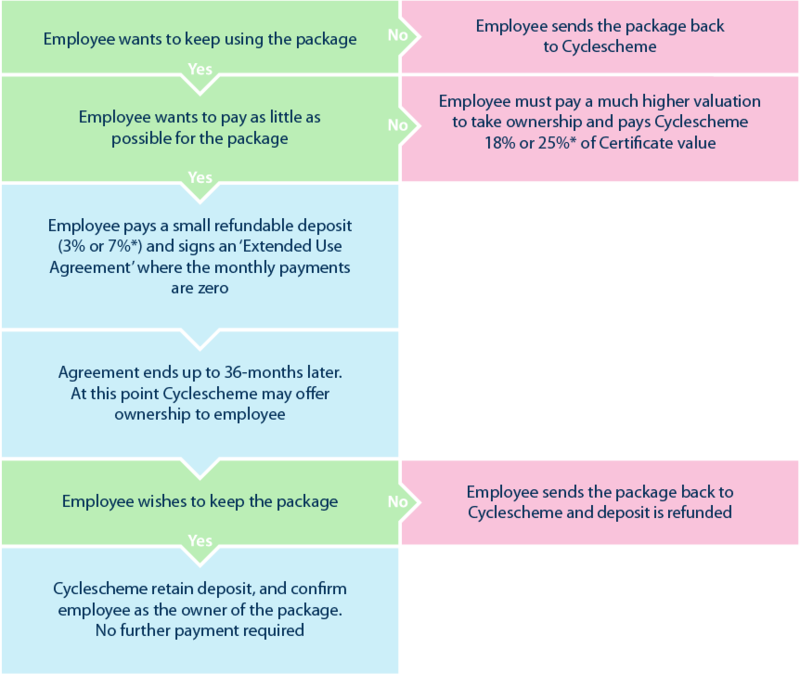 At which point Cyclescheme can transfer ownership to the employee at no further cost. Alternatively, employees can pay to take ownership of the Cyclescheme package straight away, by making a payment of either 18% or 25% of the bike packages’ original value. This dramatically reduces their savings, but does transfer ownership immediately to the employee. Finally, an employee can opt to return the bike to Cyclescheme if they do not wish to take ownership. To view a guide to Cyclescheme’s easy End of Hire process please click here. Once signed, the Hire Agreement is non-cancellable following a cooling-off period of 14-working days following collection of the goods. This means that if an employee leaves or is made redundant from their employment during the hire period they are obliged to pay the remaining salary sacrifice amount in full from net pay i.e. without any tax exemptions. For example, if an employee is on a 12-month scheme, and have had 4 Salary Sacrifice repayments taken from gross salary prior to leaving employment, the remaining 8 should be taken from their final net salary. If applicable, the employee may then be offered ownership of the Cyclescheme Package in the normal way (please refer to 'What happens at the end of the hire period?' above). Any size employer from any sector can partner with Cyclescheme. Employees must receive salary via the PAYE system, and earnings should be more than the National Minimum Wage after salary sacrifice to be eligible. Employers who pay staff close to the National Minimum Wage should contact Cyclescheme to discuss the range of attractive options available that allow lower paid employees to participate in the scheme. It is worth noting that there is no credit check for employees wishing to participate, and Under 18s can join the scheme if their guardian signs a guarantor agreement. You are able to sign-up as an employer and participant with Cyclescheme as long as you receive a salary through the PAYE system. If your salary is not paid via PAYE, you will not be able to participate in the scheme. However it may be worth discussing your options with your accountant as they can advise whether it will be beneficial to change how you are paid so you can participate. The bike and/or accessories remain the property of the employer throughout the hire period, unless the employer uses a finance company to fund the bikes; in this case the finance company or funding bank will own the bike and/or accessories. Employers can implement Cycle to Work schemes and offer a maximum certificate value of £1,000 inc. VAT per employee, thanks to a Cycle to Work exemption issued by the Financial Conduct Authority (FCA). However, employers who have or obtain the appropriate Consumer Credit Authorisation from the FCA can allow employees to request Certificates of a higher value; this means employees can enjoy the Income Tax and NIC benefit for the full value of the equipment they obtain and the employer will also benefit from increased employers' NIC savings. If an employer wishes to increase the maximum Certificate value, they can apply for Consumer Credit Authorisation from the FCA. For further details on how to obtain Authorisation or to determine which category is required, please visit the FCA website HERE or email our Contact Centre on info@cyclescheme.co.uk. Yes, we offer the same free of charge service to employers that have employees based in ROI. For further information please click here. Yes, an Open Framework Agreement is available for Public Sector organisations to take advantage of. For more details and a simple guide to implementation please click here. Yes, Cyclescheme run weekly webinars for employers that want to learn more about the scheme. Our webinars take less than 20 mins and we'll answer any questions you have. If you are unable to find the answer to your question, please get in touch with us using the contact details which can be found here.